by Laudon, Kenneth C.; Laudon, Jane P.
NOTE: You are purchasing a standalone product; MyMISLab does not come packaged with this content. If you would like to purchase both the physical text and MyMISLab search for ISBN-10 :013405847X/ISBN-13: 9780134058474 . That package includes ISBN-10: 0133898164/ISBN-13: 9780133898163 and ISBN-10: 0133974529/ ISBN-13: 9780133974522 . 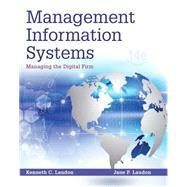 In its Fourteenth Edition , Management Information Systems: Managing the Digital Firm continues to define courses in Management Information Systems. Designed for business school students, the text provides insight into how today's businesses leverage information technologies and systems to achieve corporate objectives. Providing comprehensive and integrative coverage of essential new technologies and information system applications, as well their impact on business models and managerial decision-making, Management Information Systems increases student engagement and enhances learning through vivid examples. In this new edition, students will find the most up-to-date, relevant information about information systems used by today’s businesses–capturing students’ attention no matter their industry or vertical of interest. With the help of this text, students will build skills sought after in today’s workplace. Later on, they will be able to understand, participate in, and eventually lead management discussions and drive decisions about their firm’s information systems. MyMISLab is an online homework, tutorial, and assessment program designed to work with this text to engage students and improve results. Within its structured environment, students practice what they learn, test their understanding, and pursue a personalized study plan that helps them better absorb course material and understand difficult concepts. Kenneth C. Laudon is a Professor of Information Systems at New York University’s Stern School of Business. He holds a B.A. in Economics from Stanford and a Ph.D. from Columbia University. He has authored twelve books dealing with electronic commerce, information systems, organizations, and society. Professor Laudon has also written over forty articles concerned with the social, organizational, and management impacts of information systems, privacy, ethics, and multimedia technology. Ken Laudon has testified as an expert before the United States Congress. He has been a researcher and consultant to the Office of Technology Assessment (United States Congress), Department of Homeland Security, and to the Office of the President, several executive branch agencies, and Congressional Committees. Professor Laudon also acts as an in-house educator for several consulting firms and as a consultant on systems planning and strategy to several Fortune 500 firms. Jane received her Ph.D. from Columbia University, her M.A. from Harvard University, and her B.A. from Barnard College. She has taught at Columbia University and the New York University Graduate School of Business. She maintains a lifelong interest in Oriental languages and civilizations.